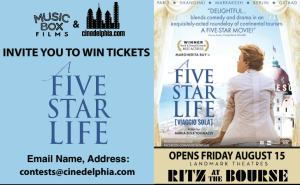 We have a bunch of tickets to see A Five Star Life during its run at the Ritz at the Bourse, opening Friday, August 15. To enter, e-mail your mailing address to contests@cinedelphia.com, winners will be chosen at random, only one entry per household please. A Five Star Life is the sophisticated story of one woman’s quest for personal and professional fulfillment set against some of the most stunning cities and opulent hotels of the world. Stylish and independent, Irene (Margherita Buy) is a single career woman in her forties with a job to die for. As a luxury hotel critic, she checks into the world’s finest establishments incognito to assess their standards, meticulously judging every detail from the concierge’s manners to the temperature of the food to the quality of the bedsheets. Her elegant, unattached lifestyle affords her the freedom to jet around the globe at a moment’s notice to experience a world of luxury, but doesn’t leave her with much of a personal life. On the rare occasions she’s not working, Irene’s world revolves around her absent-minded sister Silvia (Fabrizia Sacchi), two lively young nieces, and best friend–and former lover–Andrea (Stefano Accorsi). But when Silvia begins to deal with marital problems and Andrea faces an unexpected life change, Irene’s small support network is fractured and she struggles to balance a glamorous career with the growing desire for something more. After a chance meeting shakes up her worldview even more, she’s compelled to reexamine her choices and charts her own path to happiness despite the expectations of others.